Food For All farm manager Whitney Jacques (center) and volunteer John Jozwiak (left) sell produce at the Emerson Garfield farmers market. Whitney Jacques has always loved plants. Her childhood memories of growing up in the woods of Chugiak, Alaska, include installing a little garden with help from her dad and loving — or rather, over-loving — her houseplants to the point of drowning them. This love reached its peak when she had to walk through a farmers market booth in order to exit her apartment building. "I remember thinking how cool it was that all this stuff was happening that was so close to where I lived, but I never saw it, and I would shop from these people," Jacques says. Nowadays, Jacques is the manager of the Food For All Farm. She spends her days in the Vinegar Flats neighborhood of the Latah Valley, a mere five minutes from downtown Spokane. A program of Catholic Charities Spokane, the Food For All Farm (formerly known as Vinegar Flats Community Garden) addresses issues of food insecurity in Spokane. One manner in which the farm team accomplishes this colossal task is through their active role in the farmers market community. "The farmers markets that we sell at, we don't pick them because they're the biggest, best, most robust markets. We go there because to develop their capacity, they could really use another farmer selling produce," says Brian Estes, Food For All's program coordinator. When a market in a low-income neighborhood is trying to get off the ground, Food For All commits to helping them with logistics for as long as needed. The now-trendy Thursday Market in the South Perry district started with the help of Food For All. 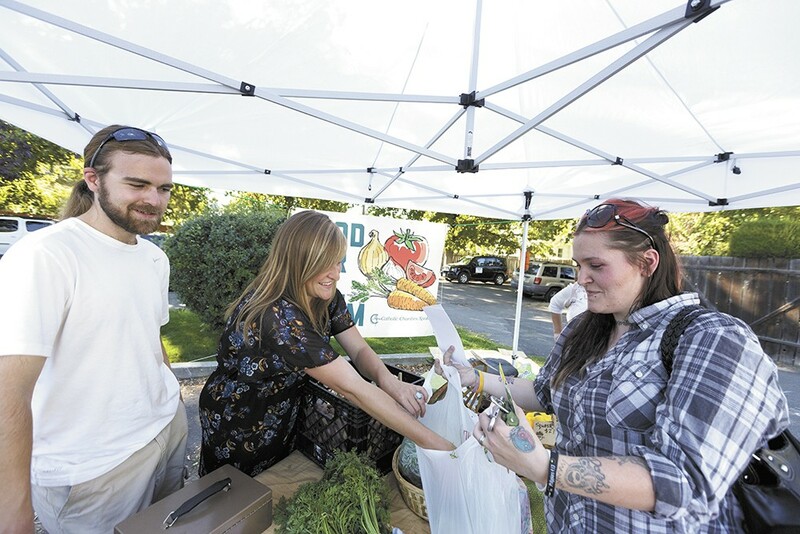 "The way, most poignantly, that I've seen [Food For All's impact] has been in the Fresh Bucks program," says Karyna Hamilton, manager of the Thursday Market. Fresh Bucks is a program that incentivizes food stamp sales at farmers markets. Recipients of food stamps can use their Electronic Benefit Transfer (EBT) card to receive tokens good for the farmers market. For every $5 they spend in food stamps, customers receive two Fresh Bucks, good for fruits, vegetables, mushrooms or herbs at any of the market stands. "It really works, and people are spending it, and it diversifies our market, which is a funny market because it's on the brink of a really disenfranchised neighborhood that is still very poor and very high-need," says Hamilton. Since the Thursday Market has taken off, Food For All has turned its focus to other markets. This year at the Emerson-Garfield market, Food For All hosted a new program called KERNEL, which stands for Kids Eating Right Nutrition Exercise for Life. Kids who participated in the KERNEL activity would receive their very own Fresh Bucks. "You would never think that kids would be so tickled to buy their own carrots, but they get so excited," says Jacques. The Food For All program started in 2002 with Estes as the only staff member. This past spring, the team welcomed two new members, bringing the total to six. As the program has grown, Estes has seen a shift in Spokane's food landscape. "There are more and more young farmers who are starting up businesses, and more places you can go and eat where they're working to put regionally grown food on the menu," says Estes. "People are starting to think more about the reality that all food starts with farming, or it's produced in the ground somewhere. I know for me growing up, it was really easy not to make that connection." The team is characterized by their determination to stay grounded in their mission. Jacques, who has utilized WIC (The Special Supplemental Nutrition Program for Women, Infants and Children) and food stamps herself, says this gives her a better perspective on the clients she works with. "A lot of people think that the people we serve are destitute or only eat candy bars, and that's not true," says Jacques.